At last Sundays flea market in Irvine, California I found quite a bargain! A complete set of china for $75. Twelve 6-piece place settings and lots of fun serving pieces. I was absolutely thrilled. It was wrapped in clean bubble wrap and in two plastic bins. 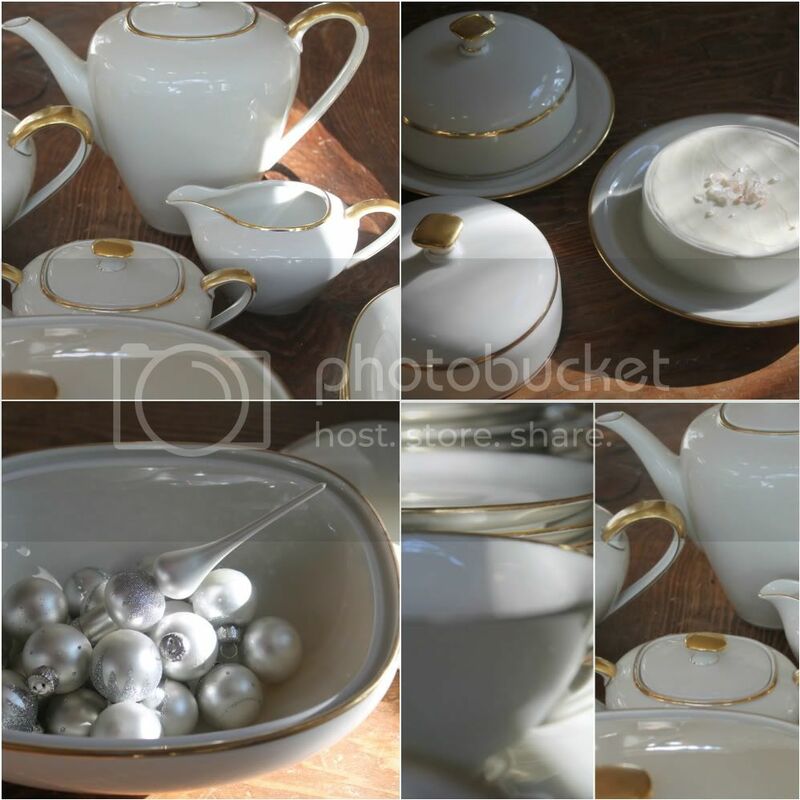 The set includes a full tea, coffee, cream and sugar set, two covered butter dishes, covered serving bowls, a soup tureen, several serving platters, bowls and plates. I also found the adorable silver ornament and tree topper set, for $5. I have been searching thrift stores for shallow soup bowls...this set came with 12. 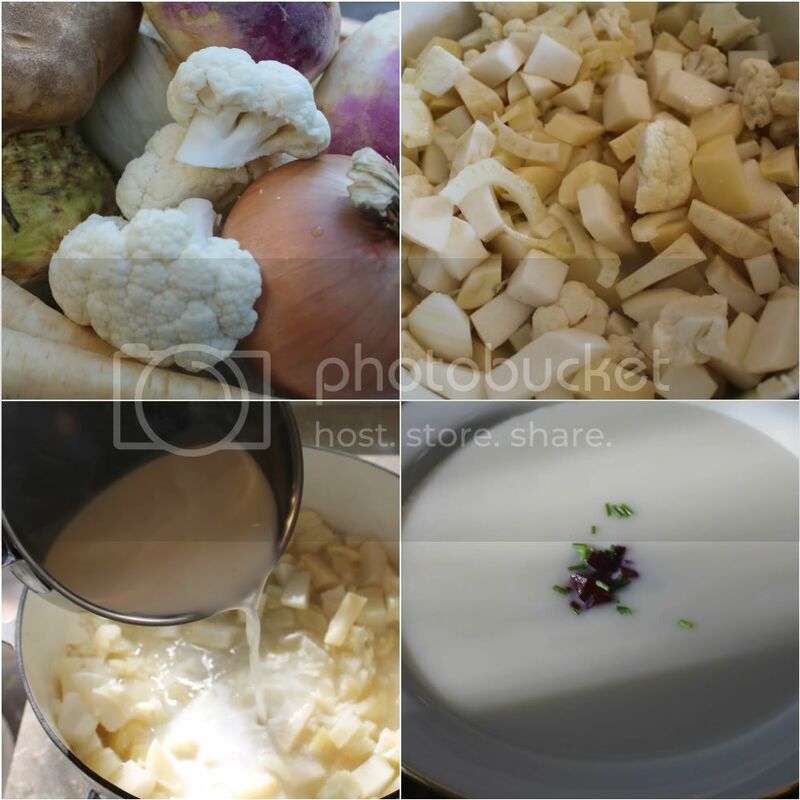 Today I made a winter white vegetable soup that will be perfect for a holiday dinner party. Recipe below. Knowing that my kids will probably not go for the winter vegetable soup, I went ahead and made some mashed potatoes and picked up a rotisserie chicken at the market. I love the way they look in my new china bowl! Melt butter in large heavy pan like a Le Creuset and add onion. Cook until tender and add the rest of the vegetables and the 4 cups of water. Add 1 teaspoon salt and bring to a boil. Then let it simmer for about 45 minutes or until vegetables are very soft. Off the heat add the hot milk and blend with an immersion blender or in batches in a regular blender. Garnish with fresh chives and roasted beets cut small. You can roast beets, but as a time saver I prefer to buy them at Trader Joe's already roasted. First off what a great score on the china and the soup looks delicious. 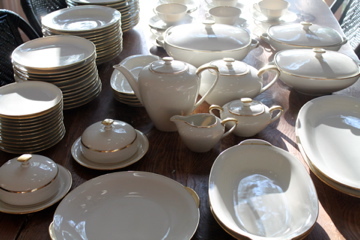 My grandmother had china very much like that set and we had many happy family gatherings eating off her china. Your image reminded me...thx. We don't have Trader Joe's in Canada and I was so impressed when I shopped at the one in Seattle...a good reason to go traveling! I love simple dinnerware and white with a bit of gold is just perfect! Fantastic find!!! I adore simple dinnerware and this white with a touch of gold is perfect! great find!! No way! That's exactly the style I have been looking for, what a bargain, and it has everything, I am gasping with excitement for you. I love White serve ware. It showcases the food so nicely. Thanks for sharing the soup recipe, I will try it this week. The winter white is so elegant, there's nothing better than a great thrift store score. And the soup is tres chic, but I've come to expect nothing less of you. I love the teeny beet garnish. Hi Annie! That china is beautiful, what a find! Are you flea markets super crowded? The ones here in SF get so crowded that I stay away. I'm not good with crowds. This soup looks amazing and so creamy and rich. My hubby and I would love it! I would probably have to end up making something for the kiddos like you did. I usually make these type of soups for my husband and I to have at lunch. I love a warm soup for lunch. It totally soothes and relaxes me. Did you end up making those sugar-crusted popovers? What a steal! Food always looks so much more enticing on white serveware. Great find! What a great find! My mom bought a similar set years ago at a garage sale and paid $25 for it - crazy right? It is beautiful! I love the classic simplicity. The soup sounds (and looks) delicious! The soup sounds magnificent...perfect for here or Mammoth. I forgot the flea market was last weekend...darn. You got SUCH a beautiful bargain! LOVE your china find! Who needs to register? The soup looks and sounds delicious. I love the butter containers that came with the set. It looks beautiful with the pink sea salt sprinkled on top. I could go for a steaming plate of those mashed potatoes right this minute! Annie: do you do Lotte Berke, it kills me! Years ago when i was a lot heavier I was told to lose weight for my health - so I wiped off 45lbs. Seriously, most of it was around my middle, I looked like Santa. Love the China set an what an amazing find! The gold edging is so pretty! Your new china is so similar to my Grandmother's wedding set, which I was fortunate to receive from her. It makes a beautiful Christmas table each year, and reminds me of happy childhood family dinners. And, now I will be thinking of all the ways you will be entertaining with your simply lovely china. Lovely china and quite a bargain! I guess with the gold you have to wash them by hand, right? Looking forward to trying that soup for my knitting group. I LOVE your blog! After seeing your big canvas picture, I think I'm going to do one too. Oh how lucky to find this china! The soup recipe looks like a must try too. Beautiful find! And the soup just makes it that much more appealing. Yum! Thanks so much for stopping by my blog. Lovely photos! Another great bargain!! The soup recipe sounds so good too. After the scramble of the holidays, I will definitely have to check back and try some of the good things that you have posted! I hope all is well with you. oh my you scored big!!! that is such a great deal for all those pieces. I must visit the irvine flea soon! What??? $75! You have got to be kidding me. What a find! I wish we had flea markets like that in Seattle. I'd be there every weekend. Just lovely! Oh how lucky are you to find those beautiful dishes for $75. They look like limoges. What a great find! Score of the year! We must go thrifting together some time.